Dinosaurs, Noah's Ark, procrastination, and Oh, crap! 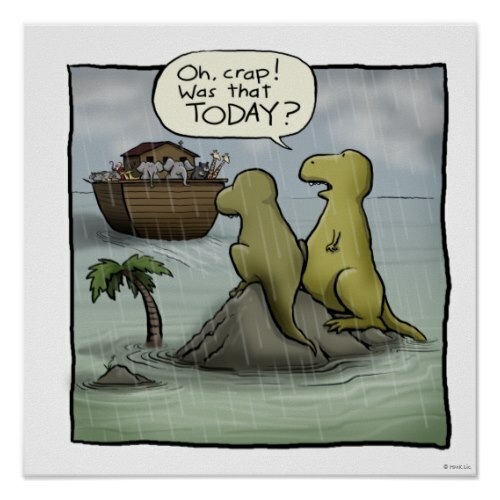 Funny, hilarious cartoon poster featuring a dinosaur couple sitting on a not yet submerged mountain top of a flooded earth, as they watch Noah's Ark float away 'coz they missed the boat. A fun poster for all the procrastinators you know, and you. Great for son's room decor, decor of the dorm room, man cave, living room, office cubicle, business premises and more. Add a touch of humor to your walls. Makes a fun gift for friends and family, especially the men in your life! A completely customizable poster. You may choose its size and even have it framed, when ordering!